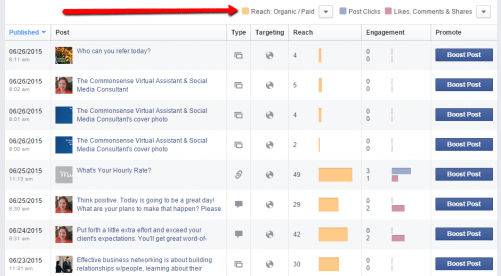 Determining what to post on your Facebook business page and what’s the best time to post, you want to make the best use of the Insights provided by Facebook. So let’s go through some basics to understand this feature better. Once you are logged in to your Facebook business page, you want to click on the Insights tab as shown below. Then click on the People tab. You want to take note of this information so you can be sure your posts are relevant to those seeing them. Next click on the “Posts” tab. Here you will find information about the days and times your fans are online and reading your posts. In the example below I see that in a recent 1-week period my fans were online more on Tuesday and at 5 pm. 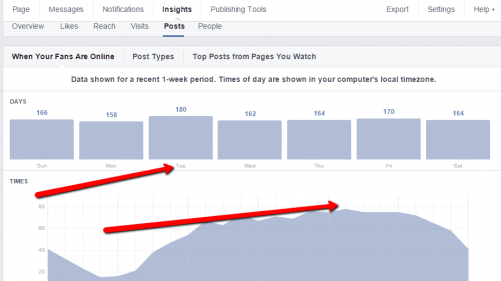 Scroll down a bit farther on that page to see more data on your posts engagement. You’ll see how much organic reach your posts have as well as likes and comments. This information can be especially useful in seeing what topics your fans are most interested in and likely to share with their networks. This is also the place where you can ‘Boost’ your posts. This is a paid feature that some have found very useful. It’s a good idea to check your Insights tab at least monthly to monitor activity and plan your strategy for your posts in months to come. I’d love to hear any other tips you have about using Facebook’s Insights tab. Share your comments below!